Jendela Informasi - Once upon a time there lived a king named King Dheema. He had two beautiful daughters. They were Kamlibai and Haribai. Though they both were beautiful, the two girls had different personalities. Kamlibai was spoiled, arrogant, and also lazy, while Haribai was kind, helpful, and smart. The king thought it was time for his daughters to get married. He first asked Kamlibai to get married. The king arranged her marriage with a prince. The wedding was so extravagant. The king invited lots of guests. They were served with delicious food. After Kamlibai got married, the king often spent his time with his youngest daughter. One day, he went to Haribai's room. He saw a placard hanging on the wall with some sentences. It said, "A home that has a wise lady in it will always prosper." The king asked, "Who wrote that?" "I did, Father," answered Haribai. "Do you believe that? Well, I don't agree with you. The person who makes the house prosper is the man," said the king. "Please pardon me, Father. I hate to disagree with you. However I believe that it is the wise woman who makes the house prosper." The king was angry. He felt that his daughter underestimated his role as the head of the family. The king suddenly had a bad idea. He wanted to arrange Haribai's marriage with a poor man. He wanted her to prove what she believed. It finally happened. 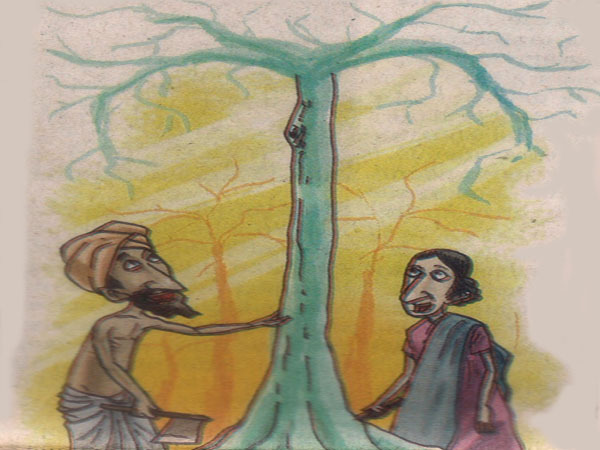 Haribai had to marry Nandu, a poor woodcutter. Haribai was an obedient child. She did what her father ordered. After they got married, Haribai and Nahdu lived in a hut near the jungle. They were so poor. Haribai was thinking how she could help her husband. She finally had an idea. She asked her husband to skip one meal. She said she would save the money to buy another axe so she could help her husband cut the woods in the jungle. After they had enough money, they bought another axe. Haribai used the new axe to help her husband. Soon, they had lots of wood. During winter, they sold them and slow but sure their lives were getting better. One day, Nandu cut a unique tree. He had never seen that tree before. When he cut it, the wood produced special fragrance. He showed the wood to his wife. Haribai said, "It's Sandalwood. It's very rare and also very expensive. Kings and queens use this wood for special ceremony. Come, we must collect these woods as many as we can!" Without wasting any time, they started to find this rare tree. They cut all those sandalwood trees and kept them carefully. Meanwhile, a king from a neighboring kingdom just died. They would hold a ceremony for the dead king. They needed sandalwoods. They had been looking anywhere but they could not find it. Finally one guard heard that someone owned lots of sandalwoods. He told the prince about it. The prince said "Please buy the sandalwoods with any price. I don't care if the price is so expensive. I want to buy them for my father's funeral ceremony." The guard went to Nandu's house. He brought lots of money to buy the sandalwoods. Nandu and Haribai were extremely happy. They became very rich! They built a very big house that looked exactly the same as King Dheema's palace. Meanwhile King Dheema visited Kamlibai's house. He was so surprised to see her condition. Though she was very rich, she did not look very happy. She looked.very sad with her marriage. Later, King Dheema received an invitation from a rich man to attend the ceremony of his new house. King Dheema did not know who the rich man was. When he arrived, he was so surprised to see the house that looked exactly the same as his palace. Not long after that, Haribai appeared. King Dheema asked her how they could become very rich. Haribai told her father about her advice to her husband. "You are right, My Dear. You are a wise lady, therefore your house is prosperous," said King Dheema to Haribai.